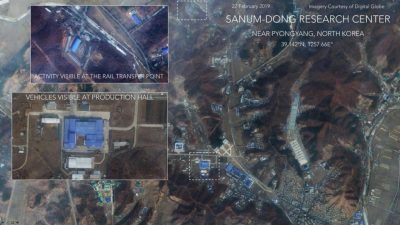 NPR’s claims that the imagery shows “vehicle activity” occurring around the facility. Yet close inspection shows that the “activity” consists of a few inert vehicles, which appear to be a white pickup and white dump truck or flatbed parked in a permanent position next to piles of metal. The scene does not appear to be different from any number of sleepy yards of businesses that can be examined by members of the public on Google Maps. Planet Labs is a private satellite imaging corporation based in San Francisco, Ca. that allows customers with the money to pay an opportunity to gain access to next generation surveillance capabilities. In February 2016, Federal technology news source Nextgov noted a statement from former CIA Information Operations Center director and senior cyber adviser Sue Gordon that Planet Labs, DigitalGlobe and Google subsidiary Skybox Imaging were all working with the Pentagon’s National Geospatial-Intelligence Agency (NGA) to provide location intelligence. Planet Labs’ own website also lists press releases detailing past contracts for subscription access to high resolution imagery with the NGA.